This Week’s Sale (2/19-2/21) 50% Off Shoes and Purses! This sale is valid Monday 2/19 through Wednesday 2/21 at all five store locations. Special Sanatoga store Sale This week (2/19-2/24), at our 2200 E High Street Sanatoga location only, all clothing is still just $1 / pc! This Week’s Sale 50% Off Toys, Games, Kids’ Clothing and Kids Books! This sale is valid 1/29/18-2/3/18 at all five store locations. Clothing Sales Monday (1/29) – All Blue Clothing Tags are just $1! This Week’s Sale 50% Off Linens! This sale includes pillows, sheets, blankets, curtains, small rugs, and more! This sale is valid 1/15/18-1/20/18 at all five store locations. Clothing Sales Monday (1/15) – All Yellow Clothing Tags are just $1! ALL WEEK (1/15-1/20) – 50% Off Red Clothing Tags! This Week’s Sale 50% Off Coats and Winter Accessories! Also 25% Off Furniture Items! Includes sofas, beds, dressers, tables, and more! Both sales are valid 1/2-1/6 at all five store locations! Clothing Sales Tuesday (1/2) – All Green Clothing Tags are just $1! ALL WEEK (1/2-1/6) – 50% Off Orange Clothing Tags! This Week’s Sale 75% Off Media! This includes books, movies, music, and more! Also 75% Off Christmas Items! Includes Christmas décor, Christmas trees, and Christmas clothing! 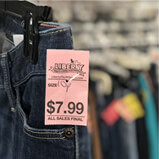 Clothing Sales Tuesday (12/26) – All Pink Clothing Tags are just $1! ALL WEEK (12/26-12/30) – 50% Off Green Clothing Tags!